Government Adda 247 Government jobs HQ Northern Command Indian Army HQ Northern Command Recruitment Apply Online for 130 Posts. HQ Northern Command Recruitment Apply Online for 130 Posts. 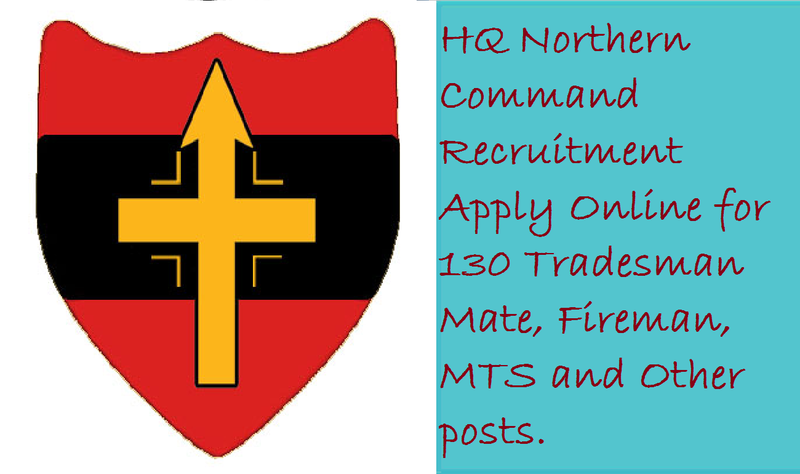 HQ Northern Command Recruitment Apply Online for 130 Tradesman Mate, Fireman, MTS and Other posts. Indian Army HQ Northern Command Notification 2018: According to the official notification of the HQ Northern Command, The total number of vacancies are 130. The HQ Northern Command has come to a panel of Defense jobs on Various Posts in Indian Army. Candidates who are eligible and interested to join into the HQ Northern Command this is the best time to move with the Fireman, Tradesman and Other posts. The applications inviting started for various posts and the last date to submit an application is 20 October 2018. To know more about the government job HQ Northern Command check the information given below. 3. 12 वी पास / कॉम्पुटर इंग्रजी टायपिंग 35 श.प्र.मि. या हिंदी टायपिंग 35 श.प्र.मि. मटेरियल असिस्टंट के लिये न्यूनतम: 18 साल, अधिकतम: 27 वर्ष, यानी एक उम्मीदवार का जन्म 20.10.1991 से पहले नहीं हुआ होणा चाहिये और 20.10.2000 से अधिक नहीं (दोनों तिथियां सम्मिलित). ऊपरी आयु सीमा अनुसूचित जाति / अनुसूचित जनजाति 5 साल, अन्य पिछड़ा वर्ग 3 साल, विकलांगों को 10 साल, पूर्व सैनिक को 5 साल. बाकी पोस्ट के लिये न्यूनतम: 18 साल, अधिकतम: 25 वर्ष, यानी एक उम्मीदवार का जन्म 20.10.1993 से पहले नहीं हुआ होणा चाहिये और 20.10.2000 से अधिक नहीं (दोनों तिथियां सम्मिलित). ऊपरी आयु सीमा अनुसूचित जाति / अनुसूचित जनजाति 5 साल, अन्य पिछड़ा वर्ग 3 साल, विकलांगों को 10 साल, पूर्व सैनिक को 5 साल.